I designed the native race (one of the cattle rustlers, the border guards, and now this mystery character) to look like goat aliens. 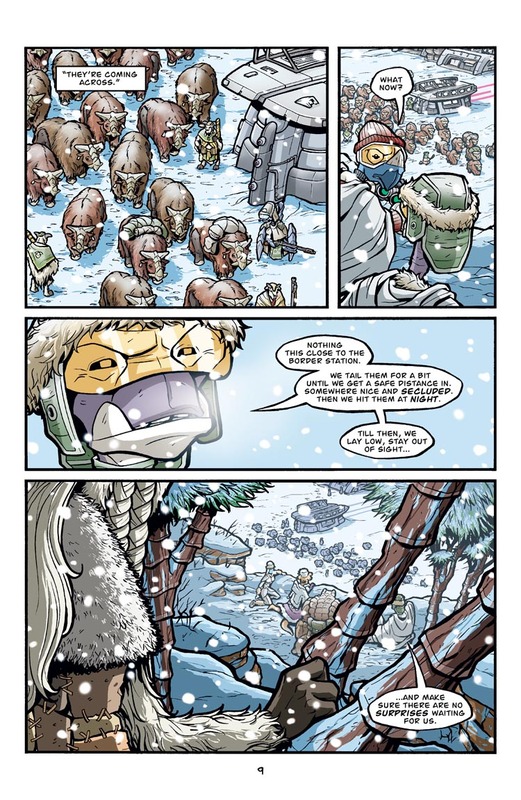 It only made sense for a snowy climate to have aliens with fur, horns, and hooves. The only thing that bugs me a little (which I realized only in retrospect) is that the designs are a bit too similar to Grissom from the first story arc. They’re not totally the same, but they do share some similarities. Suffice it to say that the mystery person here is NOT Grissom. Designing the mystery person’s clothing was a bit of a challenge. I only planned to show part of it here but also wanted it to be distinct enough that you’d recognize it again later. Originally, it was just a regular leather hide poncho, but that didn’t seem distinct enough visually. Once I came up with the stitched patchwork of hides and the fine fur collar, that seemed like a more memorable look. For a second, I thought it was Grissom for sure. The first person I thought of was Grissom. What puzzles me is why there was a need to dispel the suspicion right away. I mean there is nothing wrong with giving your readers ‘false’ clues, unintentional or not. It adds something to the reading experience. For me the suspense is in what this person will do. Eh, Grissom doesn’t have flowing white hair, and her horns point down instead of up. I wouldn’t worry about it. Just out of curiosity, though, what were the colors that you were planning to use on Grissom? I always pictured some combination of yellow and red, for some reason. I honestly have not thought about Grissom’s colors just yet! I figured I’d cross that bridge when I got to it. Funny thing is David Petersen (of MouseGuard) had done a Runners pin-up that featured Grissom and he had asked me a loonng time ago what her colors were and I didn’t have an answer. That pin-up ended up being in sepia tone! It’s awesome, BTW, and can be found in the graphic novel collection of vol 2.